View your tickets on your mobile device. Transfer your tickets to family and friends. Sell your tickets through Ohio State Ticket Exchange. Donate your tickets to charity. 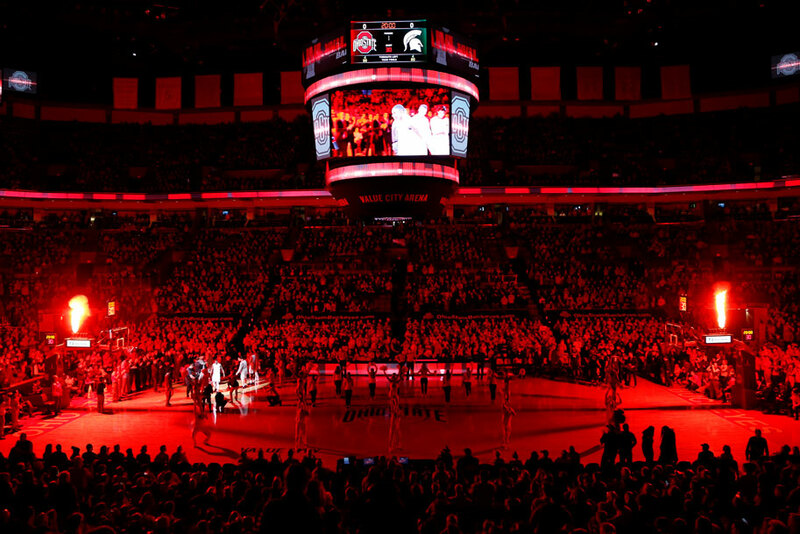 Buy tickets to your favorite Ohio State sporting events. Subscribe to Ohio State Athletics emails. 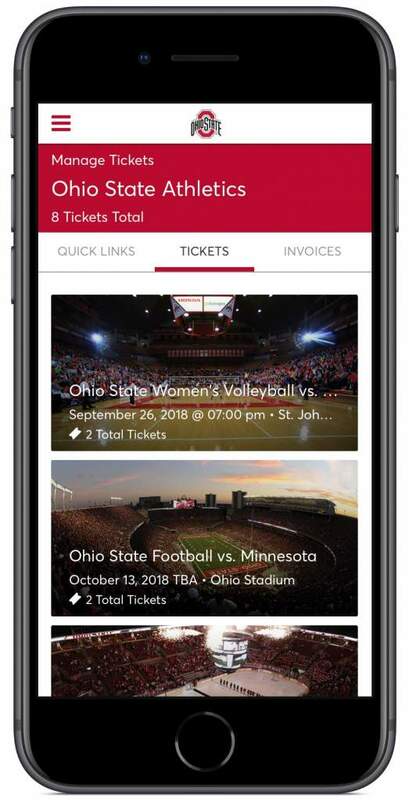 The easiest way to manage your tickets is through the official Ohio State Buckeyes app! Fans can download the Ohio State Buckeyes app now on the App Store and Google Play. Due to increased fraudulent activity with traditional Print-at-Home (PDF) style tickets, the Ohio State Department of Athletics and Schottenstein Center will eliminate Print-at-Home/TicketFast tickets beginning with the 2018 fall/winter athletic seasons. 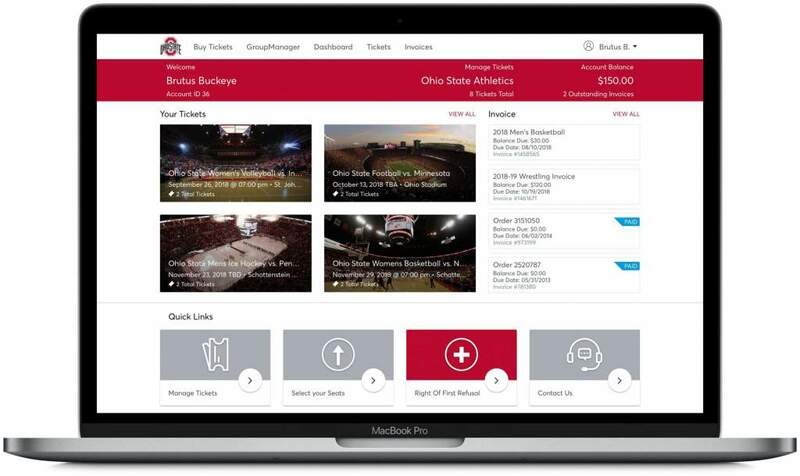 Although ticket buyers will no longer have the option to print their tickets at home, fans still have a quick delivery and entry option by utilizing mobile entry offered via My Ohio State Buckeyes Account and Ticketmaster.com. Details on how to manage your tickets and utilize the mobile entry options can be found below. Fans will also still have the option to receive traditional hard stock tickets via mail or will call. We are hopeful that this change will reduce the prevalence of counterfeit tickets in circulation and lead to a better game day experience for all Buckeye Fans. If you do not know your password or are logging into your Ohio State Buckeyes Account for the first time, click on “Forgot Password?” to have a temporary one emailed to you. Remember not to copy and paste the temporary password when you are attempting to log in. If you have any questions, please contact the Ohio State Athletics Ticket Office at 1-800-GO-BUCKS or athletic.tix@osu.edu. You can also visit your My Ohio State Buckeyes Account on your mobile device or desktop web browser. Once you have logged in on your mobile device, select the event you would like to view. Tap VIEW BARCODE on the individual ticket to display the barcode before you arrive at the venue. Swipe to view your additional tickets. Add each ticket to Apple Wallet or Google Pay. This allows for easier mobile entry into the venue. *Be sure to turn your screen brightness to the highest setting when you are getting your ticket scanned. Once you have logged in on your mobile device or desktop web browser, select the event you would like to transfer. Select each seat you would like to transfer. Enter the recipient details and confirm the transfer. 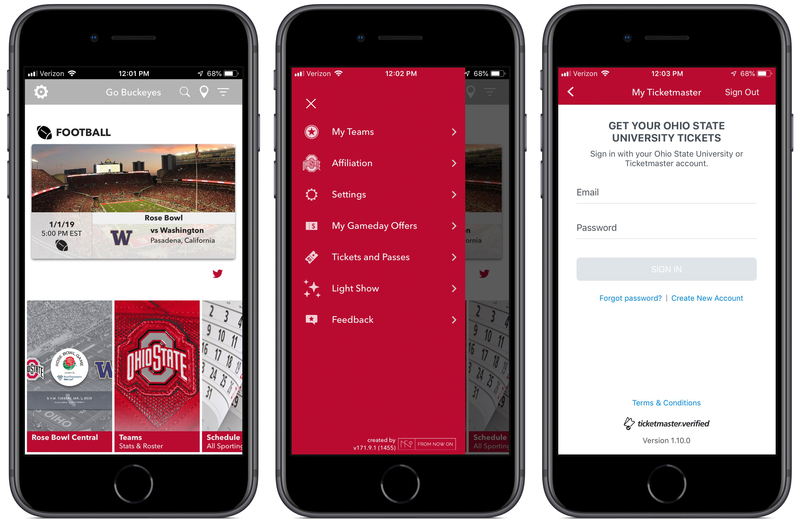 Through the Ohio State Buckeyes app, you can choose to transfer your tickets via email or text message! Note: Not all tickets are eligible for transfer. If not, the SEND button will not be shown. Once you have logged in on your mobile device or desktop web browser, select the event you would like to sell. Select each seat you wish to post for sale. Choose whether you would like the payment received to be deposited into your bank account or used for seller credit toward your My Ohio State Buckeyes Account. Continue through the prompts and confirm to submit your listing. Note: Not all tickets are eligible for resale. If not, the SELL button will not be shown. The Ohio State Department of Athletics is happy to give you the option of donating your tickets to our charitable partner, Veteran Tickets Foundation (Vet Tix). Vet Tix provides free event tickets to those currently serving in the military, veterans, and family members of those Killed-In-Action to sporting events, concerts, performing arts, and family activities. For more information, visit VetTix.org. Once you have logged in on your mobile device or desktop web browser, select the event you would like to donate. Select the box with the three dots (…) and select DONATE. Select each seat you wish to donate. Select Vet Tix as the charity you would like to donate your tickets to. Continue through the prompts and confirm to donate your tickets. Once the process has been completed, you will receive an “In Kind Gift Receipt” from VetTix for the tickets that were donated. All contributions made to the organization are deductible under section 170 of the IRS Code. The option to donate your tickets through your My Ohio State Buckeyes Account is available up to 48 hours before each game. Once you have logged in on your mobile device or desktop web browser, select the invoice you would like to pay. A summary of your invoice will appear. You will have the option to email or print it out (if using a computer). Continue with your payment. Select your payment option (pay in full, payment plan, split payment) and enter your payment information. Review your payment information, accept the terms and conditions, and confirm to submit your invoice payment. Access your tickets through the Ohio State Buckeyes app or your My Ohio State Buckeyes Account at least 24 hours prior to the event. Add your tickets to your Apple Wallet or Google Pay. Have your ticket out and ready to be scanned before entering the venue. It is recommended that you send each guest their own individual ticket if the party is arriving separately. Reference the seat location on your ticket to access your seat. Note: If you experience any ticket issues when entering Ohio Stadium, visit the nearest Ticketing Services location (Gates 13, 14, 38 or North Rotunda) for assistance. At all other locations, visit the main box office at the venue for assistance. Prevent ticket fraud by covering your barcodes when sharing pictures of your tickets on social media! Please be aware that tickets purchased from other resale marketplaces (including StubHub, Vivid Seats, Craigslist, eBay, and ticket brokers) are not guaranteed as valid for entry into the venue. Fans purchasing tickets from unauthorized sources (including StubHub, Vivid Seats, Craigslist, eBay, and ticket brokers) assume the risk that tickets purchased are counterfeit or the barcodes have been invalidated. Any fan attempting to enter an event with counterfeit or invalid barcodes will be denied entry. This includes, but is not limited to, fans entering the game with print-at-home tickets that have been altered in any way. Our ticket protection tips provide more information concerning ticket protection or verified tickets. 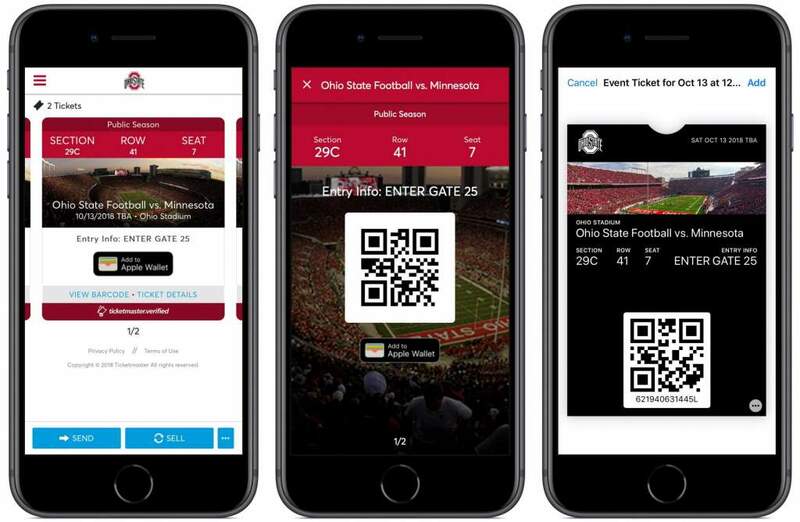 Q: Why is Ohio State Athletics transitioning to mobile ticketing? Q: I have never used My Ohio State Buckeyes Account before. Do I already have an account? Do I need to create a new one? A: If you have ever purchased tickets from the Ohio State Athletics Ticket Office, you already have an account in our ticketing system. If you do not know your password or are logging into your Ohio State Buckeyes Account for the first time, click on “Forgot Password?” to have a temporary password link emailed to you. If you do not know the email address associated with your account or have additional questions, please contact the Ohio State Athletics Ticket Office. Q: How much does the Ohio State Buckeyes app cost? A: The official Ohio State Buckeyes mobile app is free! You can download the Ohio State Buckeyes app from the iTunes App Store or the Google Play Store. Q: Can I access my Ohio State Buckeyes tickets that I purchased on Ticketmaster.com? A: You can view your Ticketmaster tickets for mobile entry on the Ohio State Buckeyes app. For more ticket management features, visit Ticketmaster.com on your mobile device or desktop web browser. Q: Can I still use my hard tickets? A: Yes, your hard tickets issued from the Ohio State Athletics Ticket Office are still valid. Using your mobile tickets is just another way to access the event. Q: Can I print my tickets from home? A: Print-at-Home PDF tickets will no longer be issued or accepted for entry at any Ohio State Athletics event except for football. Print-at-Home PDF tickets will still be issued and accepted for entry at Ohio Stadium through the remainder of the 2018 Football season. Q: Will a screenshot, photocopy or a picture of my ticket be permitted for entry? A: No, a mobile ticket must be provided either within the official Ohio State Buckeyes app, your My Ohio State Buckeyes Account on your mobile device or within your phone’s digital wallet to gain entry. Photocopies, scans, and pictures of hard tickets will also not be permitted for entry. Q: What if I do not have a smartphone, or my phone breaks, dies, or is lost/stolen before I arrive on game day? A: Simply visit the box office or Ticketing Services location at the venue. We will print your tickets for you after presenting a valid photo ID for the name on the ticket account. Q: Can I have multiple tickets on a single phone? A: Yes, you are able to swipe through your available tickets at the venue if the entire party is present. However, it is much easier to send each attendee their individual ticket. Q: What if my entire party isn’t with me when I am ready to enter? A: You can easily send each member their ticket individually since each person will need a ticket to enter the venue. Q: Does the person I send the tickets to need a My Ohio State Buckeyes Account? A: Yes. If they do not have one already, they will create one in the acceptance process. Q: Can ticket holders transfer or sell tickets after the event has started? A: Yes, you can transfer and sell tickets up to an hour after the event’s start time. Q: I am an Ohio State student. Do I have access to my tickets online? A: Ohio State students should visit the Student Ticket Central for information related to student ticketing. Football student tickets can only be forwarded or sold on Ohio State Ticket Exchange if they are upgraded to a public-priced ticket. Men’s basketball student tickets are mobile tickets and can only be transferred to another student’s valid BuckID. Ohio State Ticket Exchange is not available for student accounts containing men’s basketball tickets.